Most people have pretty terrible taste in music—it's a fact. But you, you're different. So what are you supposed to do when you happen to forget your headphones, and the only ones nearby are in use by one of the aforementioned good-taste-challenged? Why, bust out Double Music Player, of course. 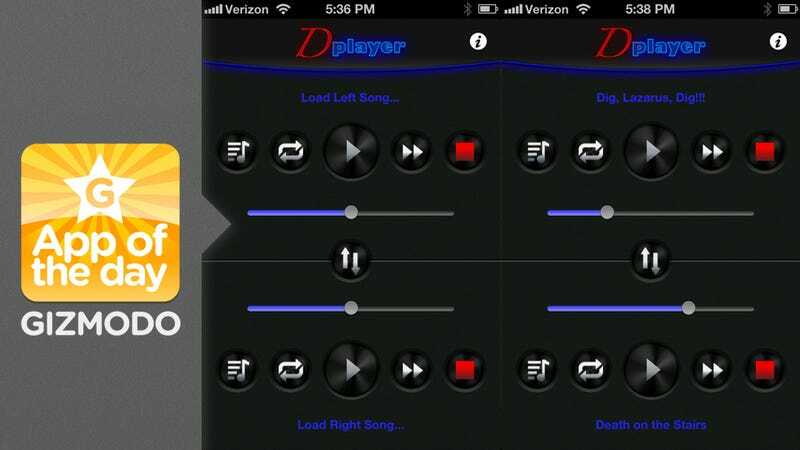 Takes the music from your music library and lets you pick two different songs for either headphone. You can even adjust the volume for either one. A simple trick, sure, but a highly convenient one, too. There's plenty of occasions (traveling, commuting, laying in the sun, etc.) that you might find yourself required to share headphones with a friend. And with sharing comes compromise, which can be highly unpleasant when it means you listening to a song that makes your hair curl. But with this, you can share, bond, and still stay true to your own musical preferences. The Worst: People will continue to make poor music choices.